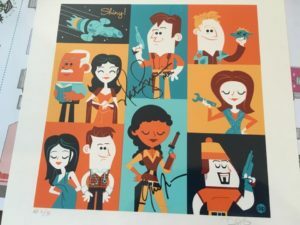 Gina Torres and Nathan Fillion down…several more to go! How amazing to get back from a long day of waiting for Nathan Fillion to sign this…and when I get home a guest of ours knows the artist personally! Everything comes full circle. Gina seemed keen on getting a copy, but we had bought the last one. If I knew how to get it to her I’d be able to get another print for her…but how does one actually get something to a famous person?